This park covers the area of Chai Prakan District and Fang District, in Chiang Mai Province. This area provides the watershed for many major rivers, particularly the Fang River as well as branches of the Lao river such as the Mae Fang Luang, the Mae Fang Noi, and the Yang Min River. The geographical features of the National Park consist of high mountains, extending northwards and forming a boundary between Chiang Mai and Chiang Rai provinces. 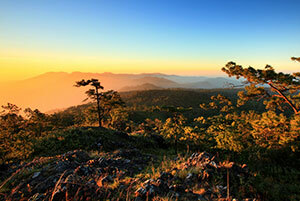 Doi Wiang Pha is the highest mountain of the National Park, with a maximum elevation of 1,834 meters above sea level. The forests in the area are evergreen and mixed forests. The weather here can be divided into 3 seasons. The rainy season lasts from May to October, and it usually rains most heavily in September. Winter is from November to February, when the weather is fresh and inviting – ideal for travelling. Winter mornings tend to be foggy. March to April is the summertime, when the weather is rather hot. There are a variety of virgin forests in the National Park, including evergreen, pine, timber forests, and mixed forests, depending on the altitude of the areas. Major tree types are teak, rubber, Leguminosae (Pradu), Michelia Alba, Pinus Merkusii Jungh (two-leaf pines), different kinds of Lithocarpus Cantleyanus (Ko), and the forests also include many types of moss, ferns, orchids, etc. Due to its abundance of forests, varieties of plants, and different altitudes, the National Park has become the source of food and dwelling places for many different kinds of wild animals including Muntiacus Muntjak, wild boars, gorals, porcupines, wild rabbits, monkeys, masked palm civets, squirrels, tree shrews, and different kinds of birds such as White-rumped Shama, turtle doves, hawks, while fowls, etc. The Park boasts great lookout points where visitors may experience the natural charms of the mountain range at dawn, in twilight or in the full blaze of day. Many high-altitude plants are found on the mountain top such as Azelia (Rhododendron sp.) and many other types of grasses and flowers. The Park contains many waterfalls, but most of them are hard to access because the Park landscape is still being developed. The waterfall which is most convenient to access is Huai Sai Khao Waterfall. It is located in the area of the Park headquarters. Huai Sai Khao is a triple-level waterfall with basin suitable for swimming. The flow is most prodigious from May – November. The uppermost level is sandy since the rock above the waterfall is sandstone. The environment around the Waterfall is so moist that all the rocks are covered with cute green moss. Other waterfalls in the area are Mae Fang Luang Waterfall, Doi Wiang Pha Waterfall and Huai Han Waterfall. All of these are small falls. The Park has two bungalows. Contact Doi Wiang Pha National Park. P.O. Box 14, Amphoe Chai Prakan, Chiang Mai, Thailand 50320. From Chiang Mai Town, take Highway No.107 for about 125 kilometres. 2 kilometres before reaching Chai Prakan District, the park entrance is opposite Si Dong Yen School. Continue for another 12 kilometres to Park headquarters.